Our town isn’t as pretty as it used to be but it gets better every day with the help of so many. It’s been a year since Irma and we have come a long way. Thanks to all who have come to help us in our time of need. Check out our Facebook page and see for yourselves what is happening these days. Coral Bay: We’re the “other” town on the Caribbean island of St. John in the U.S. Virgin Islands; the quirky, quite opposite of bustling Cruz Bay. Many of our residents are sailors who live on their boats in Coral Bay Harbor. 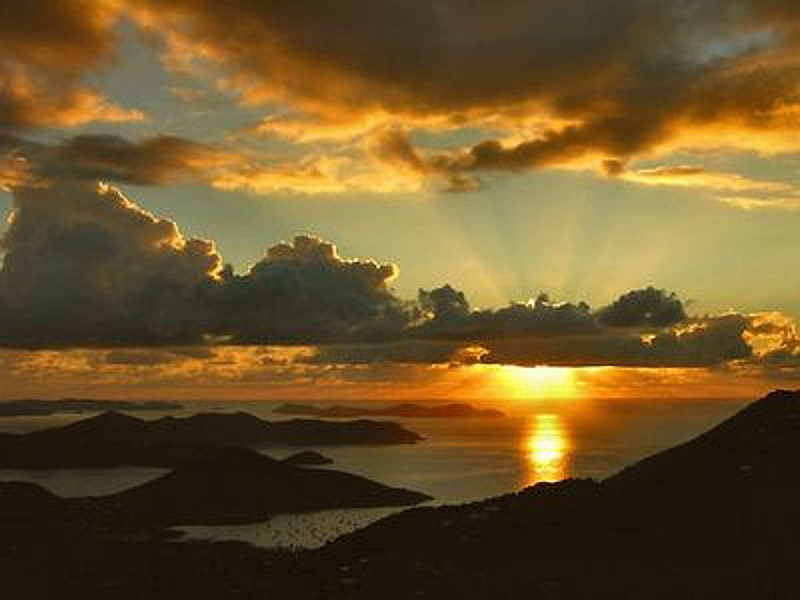 Others are landlubbers, living high up on the hills overlooking the Caribbean Sea and the British Virgin Islands. 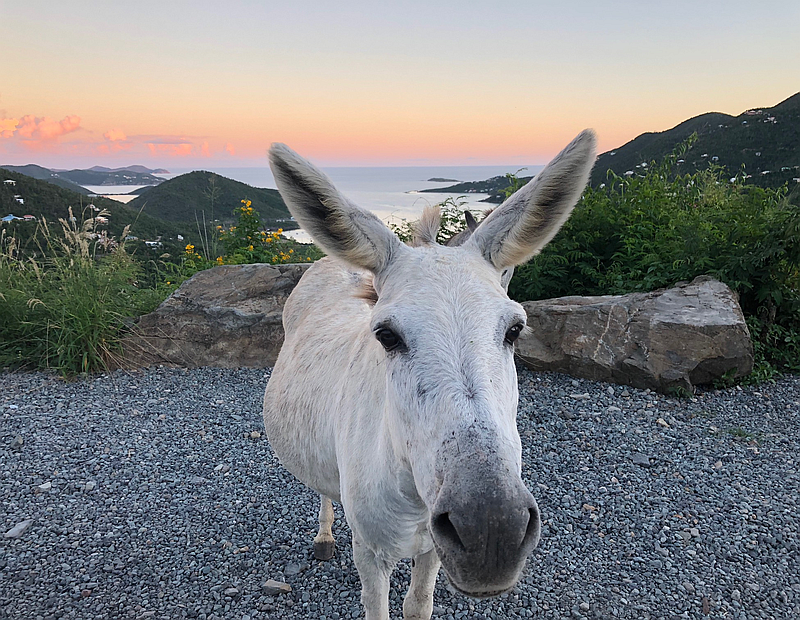 In between, there are quite a few donkeys, goats, roosters, and some mongoose who call Coral Bay home! (You’ll see them hanging out in the middle of our main road, so slow down to “island time” as you head into town!). Coral Bay has GREAT bars and restaurants, three grocery stores, and funky shops including Jolly Dog, all catering to tourists and locals alike. (There’s no gas station, so you’ll want to fill up before you head our way.). You’ll know you’re in Coral Bay when you get to the spot we call The Triangle. Look left and you’ll see the historic Moravian Church with its distinctive red roof would see had the hurricanes not taken it off. Volunteers are hoping to get the roof back. Look right and you’ll see the bus stop, surrounded by tempting signs pointing to our wonderful attractions! 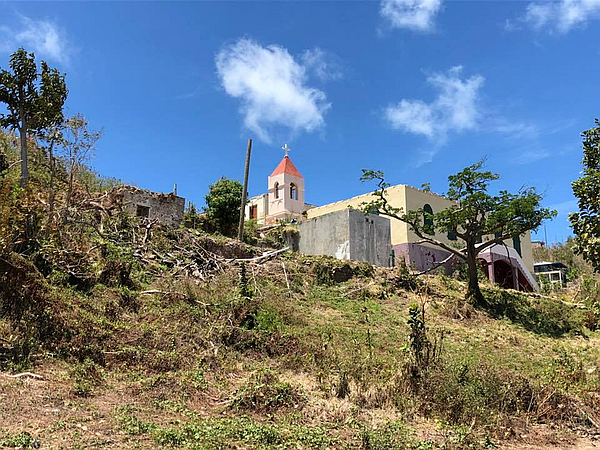 Turn right and you’ll be heading through the driest part of the island, towards the beautiful Salt Pond (a great place to snorkel) and dramatic Ram’s Head (famous for magical, full-moon-night hikes). On the way you can pick up your snorkel gear at Crabby’s Watersports (he’s actually quite friendly), shop at the Coccoloba “mall,” sample local dishes at the food carts or another option dine at Pickles in Paradise Deli, Wok by the Sea, Indigo Grill or Miss Lucy’s. Coccoloba has a grocery store, Aqua Bistro Restaurant. Remember Voyages? Now open and you can find Jolly Dog there along with the new restaurant in Coral Bay Wok by the Sea. 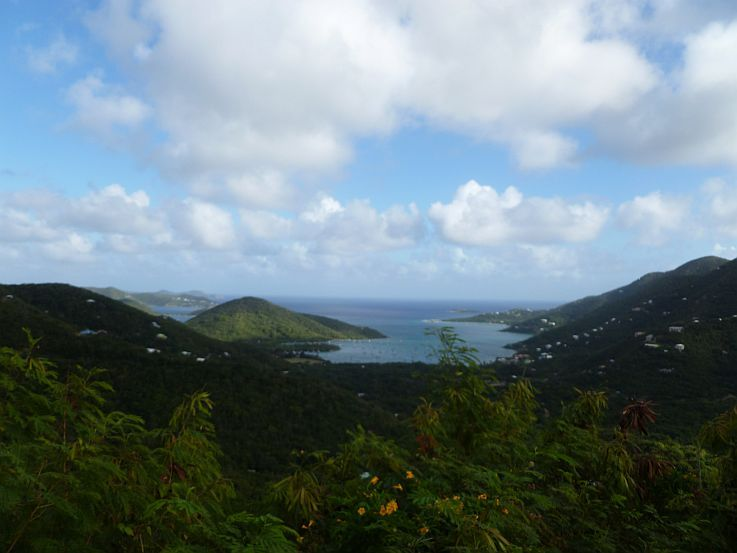 Stay straight at The Triangle and you’ll take a roller coaster drive through St. John’s East End, enjoying spectacular vistas of the surrounding islands and Hurricane Hole, one of the best protected harbors in the Caribbean. In addition, you can shop for souvenirs at Mumbo Jumbo, and check out the work of local artists at Sloop Jones out on East End. Connections East mail center can mail your postcards, hook you up to the internet and mail all your presents home. Boaters can find all of their needs at Coral Bay Marine, serving sailors and power boaters since 1984. And of course, there’s Coral Bay’s unofficial town hall, the legendary Skinny Legs, a classic burger joint and bar with excellent food. (Same Day Service guaranteed… the local gossip is free!). Looking for your own little piece of Paradise. Check out Property for Sale. 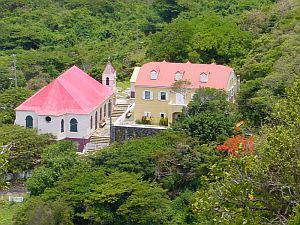 Coral Bay was the center of St. John’s plantation life in the early 18th century. For the best information on the history of St. John, visit the St John Historical Society. 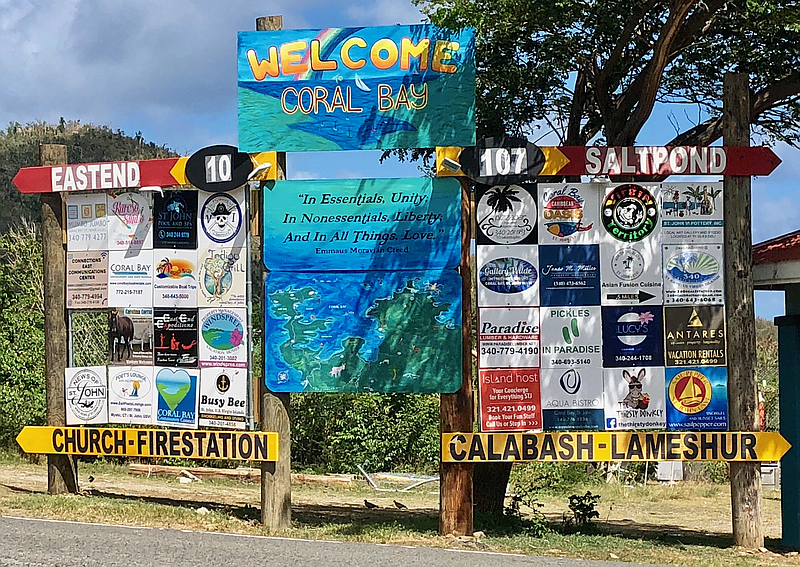 For what’s happening here these days, check out the Coral Bay Community Council. 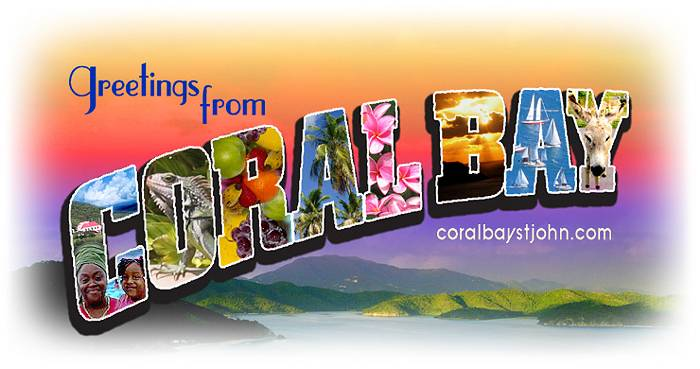 Experience Sunrise in Coral Bay! One of the best things about Coral Bay is how we take care of each other. Come to visit… You’ll see!